Originally called Magic Mountain, Heritage Square just west of Golden is a theme park and shopping village. Disneyland art directors helped design the fanciful Storybook Victorian park, built between 1957 and 1959. Magic Mountain died out but was reborn as Heritage Square in 1971. It includes shops and children’s rides. Walking around and browsing is free. 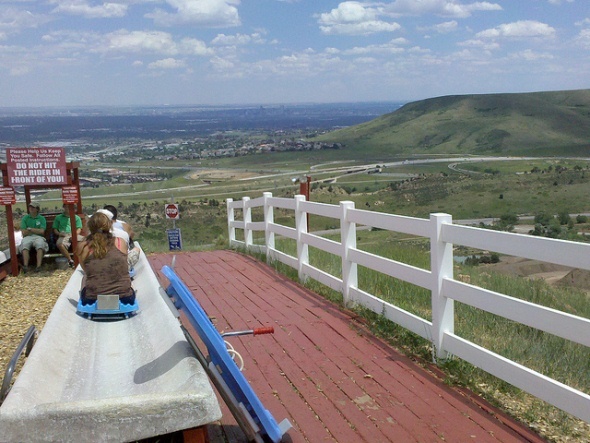 The park also now includes the Heritage Square Alpine Slide – a chair lift carries riders 490 feet up the mountainside, with a return trip via a plastic sled controlled by the rider. Much less harrowing is the Heritage Square Music Hall, which offers an eclectic mix of plays preceded by a buffet dinner. There are also afternoon children’s productions.